Only lost 1lb this week, but that is better than nothing. Also when I got the tape measure out I had lost 1/2 inch off my waist and 1/2 inch of my hips, so that is great. I have got a terrible sore neck though (nothing to do with the diet at all) it started yesterday and despite DH giving me a neck massage last night, it is still pretty sore. We are going out to visit my friend for tea tonight, she knows I am on a diet so will be kind to me. Lost 3lbs!!! I am really pleased, I haven't felt too hungry and enjoyed all the Rosemary Conley recipes. Even more pleased really because I had to have a working lunch with mayonnaise laden sandwiches and also took my boss for lunch when she came to visit - fortunately she is also on a diet. I had these Quorn Tacos last night, they were really nice. 1. Take the oven rack shelf out of the oven and drape the tortillas over each metal bar. Preheat the oven to 200C, 400F, Gas Mark 6. 2. Place the rack and tortillas in the oven for 8-10 mins until crisp. Set Tortillas aside in an ovenproof dish. 3. Heat a non-stick pan and dry-fry the onion and garlic. Add the mince and cook for 1-2 minutes. Add the stock powder, chillies, red peeper oregano, tomatoes and passata, and mix well. Simmer for 15-20 minutes to reduce. 4. Spoon a portion of the filling into each taco shell and grate the cheese on top. Bake near the top of the oven for 10 minutes to melt the cheese. Garnish and serve with salad. This is what I had for my supper tonight and it was delicious. It's a Rosemary Conley recipe from the Low Fat Cookbook. It also says it works well with chicken. Heat a wok or large non-stick frying pan. Season the port, place in the wok or pan and brown on both sides. Combine all the sauce ingredients. Reduce the heat under the pan and pour the sauce over the portk, stirring continuously. Add the spring onions and simmer, uncovered for 5 minutes, stirring occasionally. Sprinkle with the parsley and seve with rice or noodles and salad. I cooked the salmon in the microwave as I didn't have any left over and,I have to say that, I didn't do the last part as we were ready to eat, and it was still really nice. I'll bet Clarie Maconald of Macdonald has an AGA!!! Looks like it's going to be a good year for brambles (blackberries). 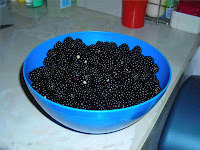 This is what I collected yesterday morning just going up and down our lane. Cooked some yesterday and then added crushed raspberries and served with greek yogurt. Put the rest in the freezer.